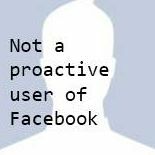 Cal Newport on his Study Hacks blog highlighted why he doesn’t prefer joining Facebook. His rant can be read here and here. He even gives an advice as to why one should quit Facebook. I agree with most of the things he has outlined. I spend less time browsing through unsolicited junk. An year ago, I had put up this as my display picture. I also added the following disclaimer on my profile header. My stance was a bit aggressive. It had to be. Beyond anyone else, it was pure a standpoint to counter my own bad habit of spending countless hours on the rants of psudo-political intelligentsia, cat videos, finding out what my batchmates were doing, etc, etc. I was also involved with somewhat of a passive marketing arm of my band’s throughput. As time went by, my fellow bandmates took over that tasks (and were much more involved in doing it), I decided to stop the “self-promotion” and “visibility”. Frankly, these are marketing gimmicks of the new century. I am a bit worried about our focus on public attention. In the last two years music has taken a huge setback. Back then I was active on Tumblr. The posts are still archived here, although I don’t write new material on the platform anymore. What I noticed was that no one bothered beyond the initial shock value that the post might have generated. And in the substantial earthquakes generated by cat videos, narcissistic photographs and controversial posts, this change was a mere mild tremor. As promised in the disclaimer header, I had replied to almost all significant messages I had received in my message-box. The inflow greatly reduced as time went by. A month ago, I put up a new disclaimer. By then I had reduced my Facebook access counts to not more than once a week, that too for a few seconds to check if there is a message pending. I had also put up the two websites that I currently maintain. These are still good places to know my thoughts and actions that I have decided to make public. I can actually focus on doing some amount of creative stuff. While Facebook in no way hinders people from doing it, it is still a distraction. There are a few more distractions that I have to get rid off in coming times but this was my first successful attempt. People take communication a bit more seriously while interacting with me. When people mail me, they usually have something they deem to be important for me to have a look into. This has been a positive thing so far. I am never bothered by mails that say “Hey Sauvik, here is a cool video”. I am not bombarded with unwanted photographs. There are three kinds of useless photographs that tops my list of irritating visuals. First off, the enthusiasm of a new DSLR and the self proclaimed meaning of life photographs. These often involve pensive people, colourful junk and the customary self portrait in front of a mirror. Second on the list would be pictures of vacations that may have one good photograph hidden in a stockpile of novice photographs. These might have some significance for the poster, especially if he wants to preserve memories, but have nothing for any of the other viewers. The third would be narcissistic photographs – no description needed. My communication to the outer world is concise and coherent. That is because, the blog is the only online voice I have. I usually put some effort in writing and editing a post before making it public. My source of news is a physical newspaper. It takes about 2 minutes to skim through the carefully edited headlines on a printed newspaper. I choose the interesting ones and devote another fifteen minutes. I don’t do this everyday, either. In the coming six months, I will deactivate my account for good. I don’t need it, it doesn’t need me. I have a few residual accounts on Twitter (which I never used) and some other junk social media sites. I will delete them, too.